SpaceX recently launched the Falcon Heavy into space while carrying Elon Musk's car to be sent into orbit around Mars. 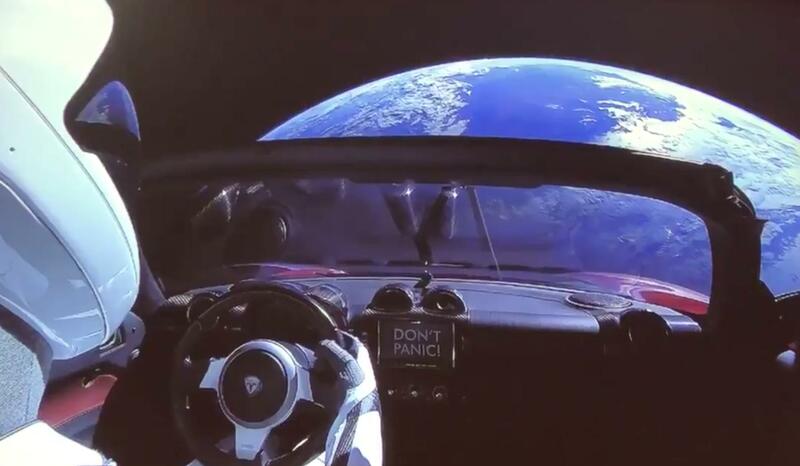 (News article reference) During the launch, footage was shown of a space suit wearing mannequin in the front seat of the Tesla, while earth is visible in the background. As you can see, around the dashboard of the car there are the words "DON'T PANIC!" and I am sure it is a reference to something sci-fi related but can't think of what. My question is: What is this a reference to? It's from The Hitchhiker's Guide to the Galaxy. 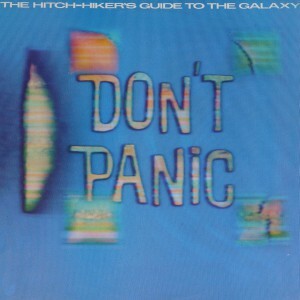 In the series, Don't Panic is a phrase on the cover of The Hitchhiker's Guide to the Galaxy. The novel explains that this was partly because the device "looked insanely complicated" to operate, and partly to keep intergalactic travellers from panicking. 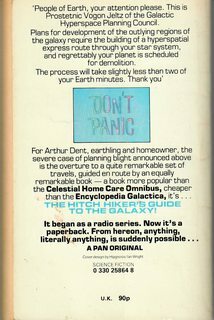 Don't Panic is so well known as an H2G2 slogan that it's even the title of the official companion book by Neil Gaiman. The Hitchhiker's Guide to the Galaxy (a.k.a H2G2). 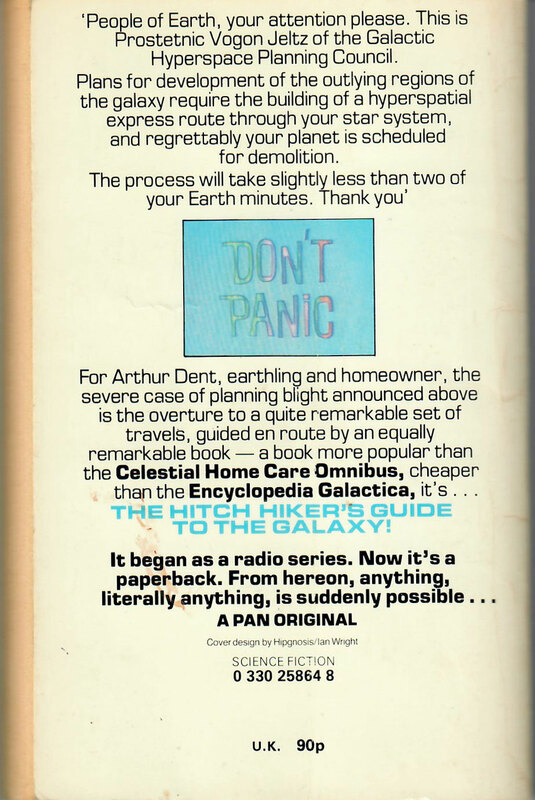 In the original radio series of H2G2, Arthur Dent is looking at the cover of the in-Universe book, The Hitchhikers Guide to the Galaxy, which says: Don't Panic. Arthur: Don't Panic. That's the first helpful or intelligible thing anyone's said to me all day. Ford Prefect: That's why it sells so well. Though existing answers have firmly established the origin of the phrase, the logo itself is actually a later incarnation. The original was on the cover of the audio vinyl album, released in 1979 by Original Records. A very similar logo was on the back cover of the original UK edition of the first HHGTTG book. Both were 1979, I'm struggling to find exactly which of the 2 was actually the first released, but both covers were done by Hipgnosis so the shared logo style has a common source. In fact, much as fans of the originality that made HHGTTG a hit might wish otherwise, the phrase was already part of UK popular culture at the time of publication. Seventies prime time sitcom Dads Army featured a character called Corporal Jones, who would usually panic whenever a minor issue came up while - here's the comedy - rushing around shouting "Don't panic!! 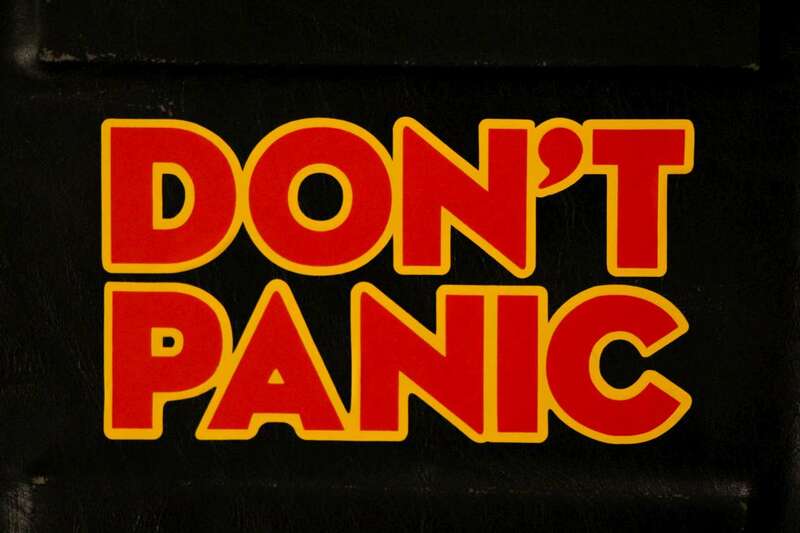 Don't panic!!". I'm pretty sure Elon will be referencing the HHGTTG though. Not the answer you're looking for? Browse other questions tagged quotes reference or ask your own question. Where did the line “Don't tell Harry” originate from? Is Starkblast a Song of Ice And Fire reference? Do earlier books in the Witcher series already reference the Arthurian legend? Is Pinkwater in The Expanse a reference to the author of “Fat Men from Space”? Is the “bear monster” in Annihilation film a deliberate reference to alzabo from The Book of the New Sun? What does “the princess and the queen” refer to here?